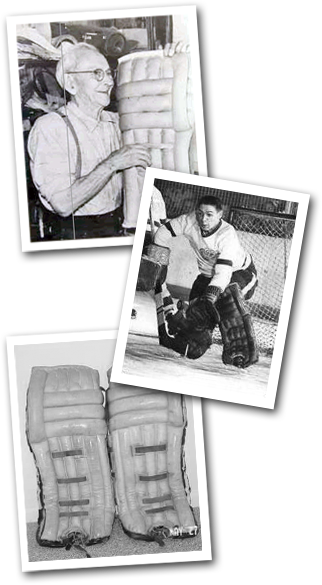 In 1924, Emil "Pop" Kenesky was credited with the invention of a new and better goalie pad. These new pads were modelled from cricket pads, and widened to approximately 12 inches. The new pads were quickly sought after and this style of pad was used by a majority of goaltenders during the Kenesky legacy of handcrafting pads. "Pop's" was originally a harness maker, later switching to bicycles and then he added sporting goods to his array of products. The definitive point in his years came when he reinvented the hockey wheel ... the goalie pad. It was the manager of the Hamilton team,then of the National Hockey League, that approached "Pop's" to create something new for his goalie, Jackie Forbes. Before long, there were pro goalies coming into the store to buy the pads off the shelf, the wait for a custom pair proved too long for most and the Kenesky's had to turn away customer after customer. Only the pro goalies and top senior and junior 'A' goalies had a chance of getting their hands on one of the 300 pairs that the store turned out in a year. From 1969 - 71, every goalie in the NHL wore Kenesky pads. Goaltending giants wore the Kenesky name, legends like Terry Sawchuk, Gump Worsley, Glen Hall, Harry Lumley, Turk Broda, Johnny Bower and even Ron Hextall most recently. "Pops" created variations in the models to suit the requirements of his goalies as the years went on. Wilf Cude of the Canadiens suggested that his pads should stand out more from the knee down, and take away protection above the new flare point. Turk Broda offered a variation to Cude's style and had an extension added over the instep, allowing for better control on the low shots. As the years went on, padding above the knee was suggested back into the model and these forced continuous modifications, eliminating weight and enhancing on features to make the goalies job a bit easier. Keeping in mind the original pad weighed 17lbs 'A PAD'! The original pads were made from California creamed horse-hide, cotton sheeting and kapok. As contractors leave marks on their jobs, goalies left their marks on the their equipment, requests to have a rabbit's foot sewn into the pad was amongst the requests of customers, not a shocking detail if you are familiar with the habits of most net minders. The Kenesky pads have been everywhere, on virtually every leg of all the stars of the hall of fame and the unheralded keepers of the cage. The pads have even rode on the Hindenberg for a special delivery, but the Kenesky's never bled into more than 300 pairs of pads a year, having to turn away many wanting customers. "Pops" was still putting in his eight hours a day when he was 86, it was 11 years later in 1974 that the equipment industry and hockey world said goodbye to Emil "Pops" Kenesky. Jack, Ott, Frank & Ed Sr., the sons of Emil, would continue to care for the infamous store, until ownership changed hands to more hockey enthusiast, sworn to uphold the integrity and tradition that lies within the walls of the shrine that is Kenesky Sports, the home of the Goalie Loft and the maker of the goalie pad.